After a last minute effort by hackers to interfere with the French election, centrist candidate Emmanuel Macron still handily defeated his far right adversary Marine Le Pen. How the French press will handle the campaign hacks following a mandated blackout on election reporting remains to be seen. The election in France has been seen as a sort of litmus test for the direction the world may be going, and a sudden case study in how outside hacking could affect the electoral process in nations other than the United States. Le Pen has a long history with the National Front, a party with an extremely racist history. She was seen as a potential continuation of a trend in nationalism that began with Brexit and continued with the election of Donald Trump. The international community feared her election as president could threaten the existence of NATO and the European Union. Ever since Russian hacking groups allegedly interfered in the U.S. election, worries of similar efforts to help Le Pen have plagued French politics. Russian President Vladimir Putin very publicly favored Le Pen to win. Hacked documents from Macron’s campaign did eventually appear online on Friday, just hours before the French press was legally barred from commenting any further on the election. Today, voters hit the polls, and it appears that the hacked documents did little damage to Macron’s lead. Polls closed in France at 2pm EST, and early estimates showed Macron winning with 65 percent of the vote. Le Pen managed to snag just 35 percent of the ballots. She conceded defeat just moments ago. So, does this mean that the public has come to understand this kind of leak as a disinformation campaign by nefarious entities? Not necessarily. Because the press was unable to report on the content of the documents, they seem to have had little effect. It appears that in the short time the documents were available, about 40 percent of the tweets sharing #MacronGate were coming from bots. It’s still unclear if there’s any information in the documents that would be scandal-worthy. The Macron campaign characterized the information as mundane memos mixed with some fabricated documents. Subsequent analysis largely echoed that sentiment. We will see in the coming days if the French press finds any substance within the stolen documents. Despite the fact that WikiLeaks has shared information about the Macron documents, the whistleblowing group’s own French lawyer tweeted that the release disgusted him. It would seem that this data dump was an obvious attempt at political meddling, and if there was more substance to be found in the documents, they would have appeared earlier. 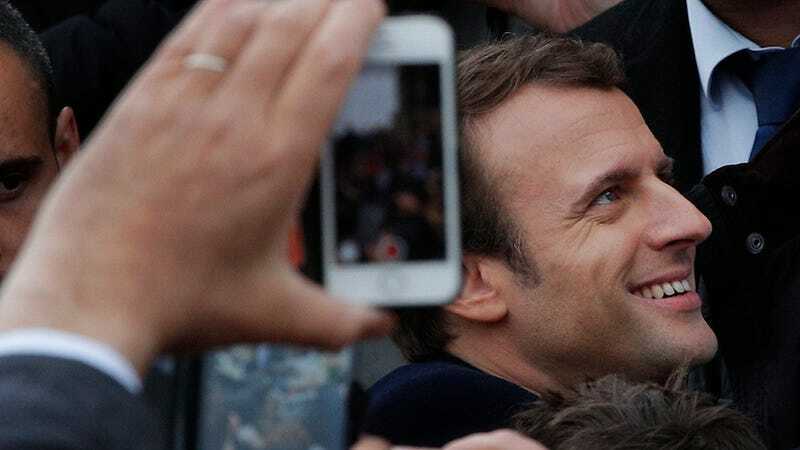 Cybersecurity firm Trend Micro warned that the Macron Campaign had been targeted by the Russian hacking group known as Fancy Bear back in April. Anyone who opposes holocaust denial is glad to see Le Pen defeated today. Anyone who fears future interference from hackers in western democracies is breathing a small sigh of relief, as well. But, Macron will now have to lead the second most powerful country in the E.U. at a time when citizens are impatient with the direction the world is moving.